I had a fantastic day yesterday! I was up far earlier than I needed to be, but felt great about jumping out of bed and getting things done. I cleaned my room, and took my time eating breakfast, reading as I did so. I did every stretch I ever learned and decided I wanted to see how many pushups I could do in a row without stopping. I did 50, then 10 more after a 5 second rest. Then, 20 more, after a 5 minute rest. I felt amazing. My body was limber and feeling quite ready to be graceful, and my ego was boosted via the pushups. I had a presentation later that night which required formal attire. I decided that since I was feeling so good, I might as well dress up for the whole day; blue dress shirt, black dress pants, and my favourite tie (I only have 3, but am working on that). I walked to catch the bus and approached the whole day with a sense of calm, and inner confidence which I have not in such complete terms in a long time. I was fully prepared for my presentation and classes went very well, I felt I learned a lot. This weekend, I will outline the details of my presentation and how it went, but basically, we were informing industry sponsors of our projects, or reminding them as the case may be, and showing them our progress to date. It was, again, a brutal session fending off the questions of those concerned with business compared to our entire education which only teaches us the engineering side of business. All in all, it went much better for my group this time, and I was very glad for it. Making my way to my friend's house, it was the anniversary of his birth, and I felt bad for not being there earlier. However, we had talked about it before, I spent most of the day before with him, and he knew I was doing my best. I made it there, excited to see him, and glad he seemed to be having fun. After a couple of hours of movie-watching, video-gaming, and near diabetic-inducing cake/ice cream eating, I made my way ready to depart. That's when he surprised me with my Christmas present. 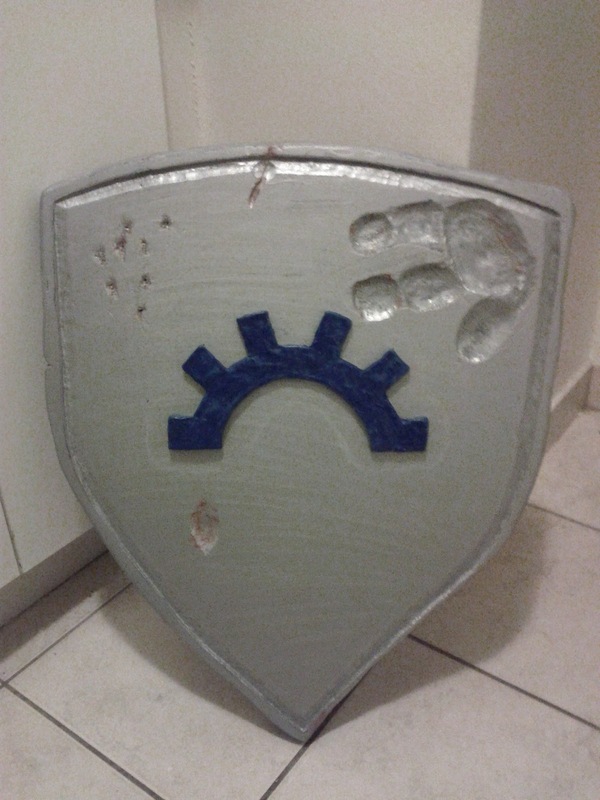 I will go into the significance and background a little more in subsequent posts, but my friend made me a shield, modeled after one I had imagined and used as my character Mark in our 2-year Dungeons and Dragons adventure together. The design is a kite shield, very common in fantasy and history. As you can see, there is a blue semi-circular gear in the middle of it. That is the symbol of Erathis, the god of invention, and law, and my character's chosen deity. 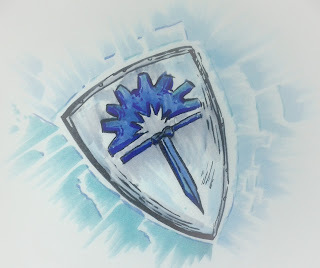 In D&D, Erathis is the symbol of law and order, and my character fought for those ideals. The 3-fingered hand print came about when another character's guardian, a warforged (basically a robot), P3TR being his name, gave me his blessing and sent me on my way to adventure. The shape of the shield is a little skewed on one side. This is to represent two things: an explosion in a town which separated me from my shield and was an important event for all our characters, and also the repeated use of the shield for bashing goblin's heads in. The scar running down the centre near the top was the result of an attack which should have killed me, had my friend and fellow adventurer not saved me, and instead left me blind. I am going to polish the adventures and re-post them here, one a week. My friends and I are planning on turning it all into a book, and so I invite you to check out the material as it becomes available, or all of it at once if you go here: In Search of Fate adventuring logs. Oddly, the site is in reverse-chronological order, so scroll to the bottom, sorry about that. We hope to get the book design and pictures started and finished soon as I would be very honoured to give out a copy to the players and creator of the game who made it all so worthwhile. It's really just a matter of getting people together and doing some drawings to offset the 80 pages of diary-style text, but I am good at getting people together, and my friends are talented artists, so we'll be done soon, I hope. And that's it. I came home, feeling refreshed, content, successful, and scaring people a little holding a kite shield at my side. I am thankful for so many things, not the least of which is your support and reading of this post. I'm glad you liked it, old friend.